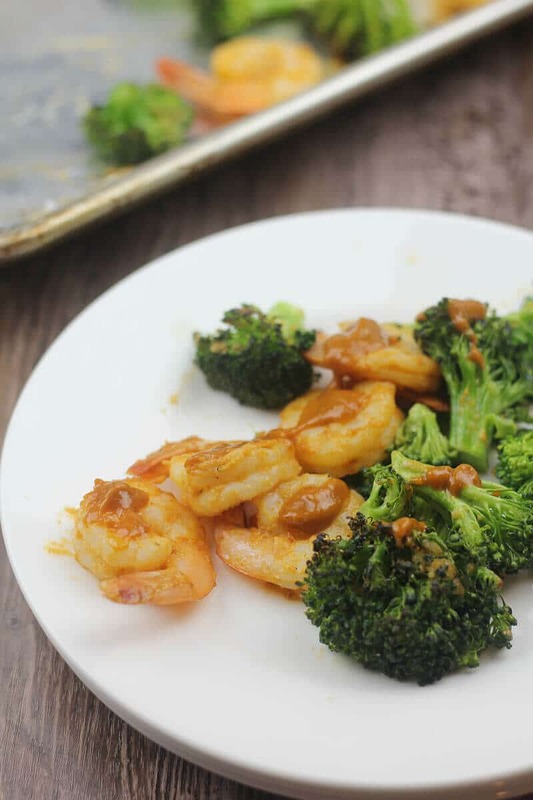 Broiled Shrimp and Vegetables with a spicy Sriracha peanut sauce is a quick and easy recipe that’s made on one baking sheet with little effort and easy cleanup. Even though we’d like to, we can’t eat fried chicken and mashed potatoes all the time. In fact, we rarely eat those things. We do eat way too many sweets, but unfortunately that’s a side effect of being a food blogger! 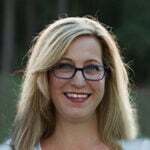 As part of our overall goal to eat healthy foods, and my goal to offer you recipes that can be prepared quickly and easily, I’m always on the lookout for recipes that can be done in one baking sheet or skillet with minimum chopping and easy cleanup. Doesn’t that sound great? 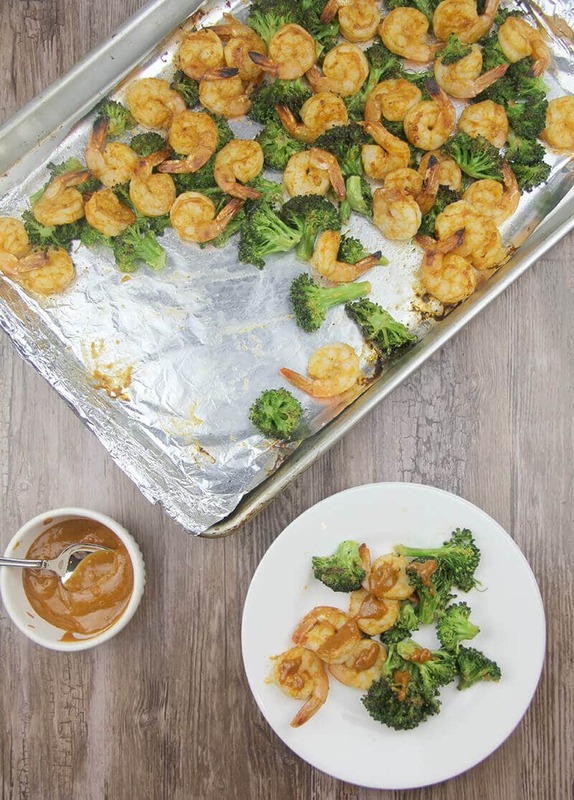 I was excited when I ran across this recipe for Broiled Shrimp and Broccoli in Fine Cooking magazine because it fits all those requirements—no chopping (if you buy pre-chopped vegetables) and it’s all done on one baking sheet, with the exception of the spicy Sriracha peanut sauce. I used broccoli the first time I made this recipe, but you could substitute almost any vegetable: Brussels Sprouts, cauliflower, carrots, potatoes, or a blend of several vegetables. If you choose carrots or potatoes then I would suggest roasting those for a bit before using the broiler. The spicy peanut sauce lends a flavor similar to an Asian satay. I added extra Sriracha because we like our foods to be spicier but you could dial it back if you want less heat. You can make the spicy peanut sauce ahead of time by a few days if you want to save a little time. Then this recipe would come together in about 10 minutes. I served the Broiled Shrimp and Vegetables with a simple green salad, similar to this Green Salad with Arugula and Fresh Herbs. You could add some French bread or a little brown rice and enjoy a complete meal in less than thirty minutes. And for a quick and easy weeknight dessert, consider trying this Old-fashioned Fudge Pie—my family’s favorite! 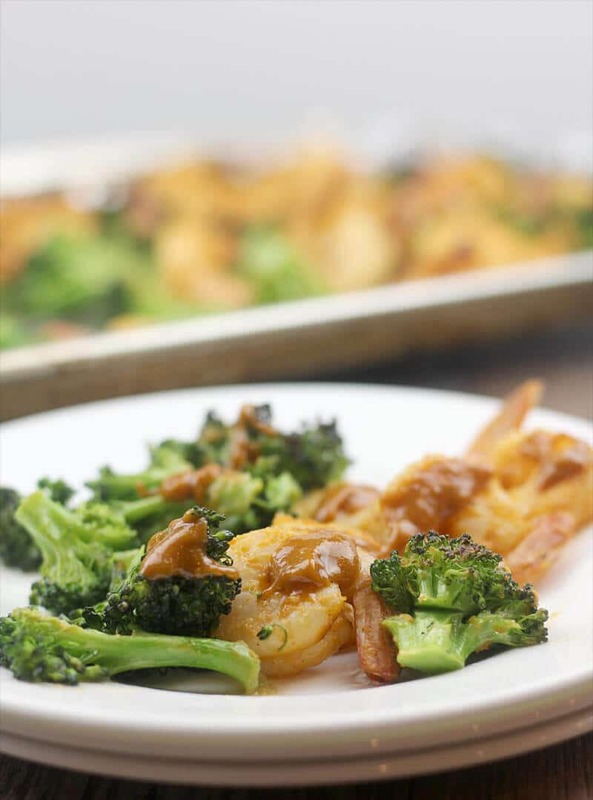 Broiled Shrimp and Vegetables with a spicy peanut sauce is a quick and easy recipe that’s made on one baking sheet with little effort and easy cleanup. Position rack about 6 inches from broiler element and preheat broiler on high. Line a large, rimmed baking sheet with foil and lightly spray the foil. In a medium bowl, whisk together the peanut butter, soy sauce, dark brown sugar, sesame oil, Sriracha sauce, vinegar, lime juice, and water until smooth. Toss the shrimp with half of the sauce and set aside the remaining sauce for serving. On the prepared pan, toss the vegetables with the olive oil and sesame oil, garlic, salt, and pepper. Arrange in a single layer and broil 3-4 minutes, until lightly browned around the edges. 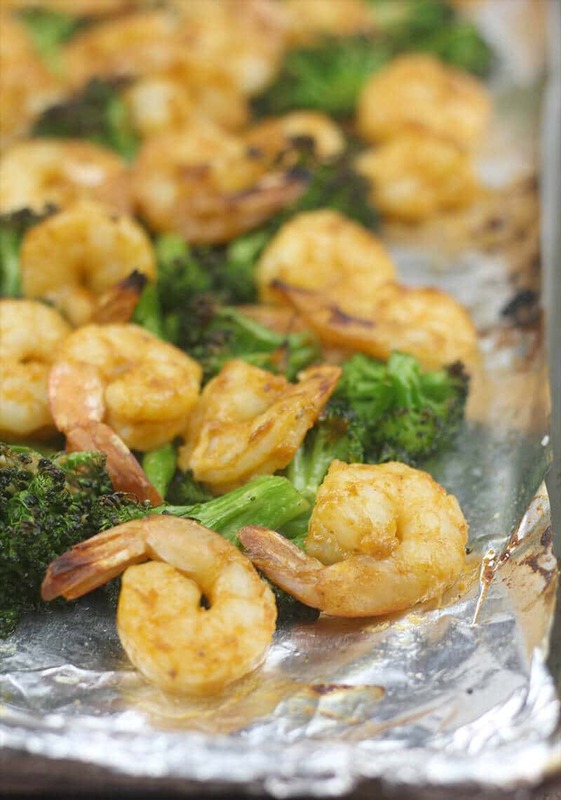 Remove pan from oven and spread the shrimp on the pan, over and around the vegetables, as evenly as possible. 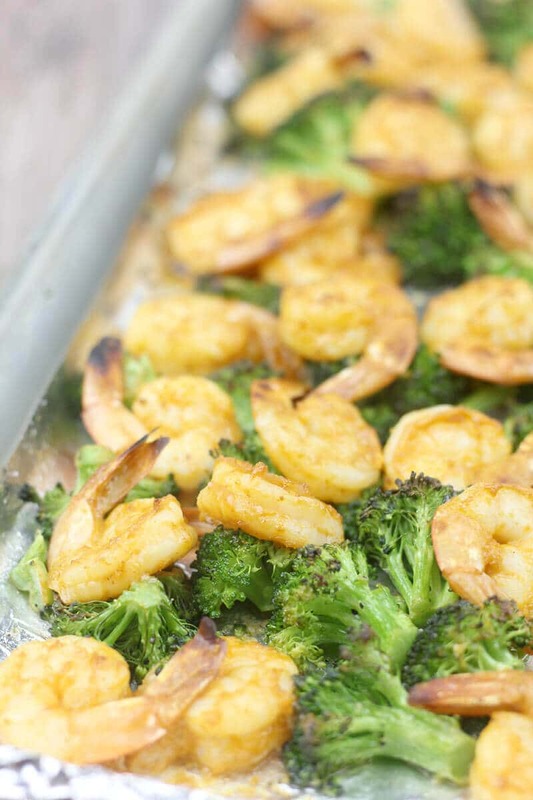 Return pan to oven and broil until shrimp is cooked through and vegetables are charred on the edges, about 3-5 minutes. Drizzle the remaining sauce over the shrimp and vegetables and serve immediately. 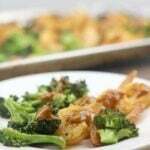 Recipe slightly adapted from Fine Cooking magazine’s Broiled Shrimp with Broccoli.